The Catalog Toolkit for Visual Studio. This tool integrates The Catalog NoSQL Database System into Visual Studio 2017. Therefore in design time you are able to create, manage and monitor The Catalog instances. The toolkit integrates the process of creating The Catalog instances from within Visual Studio 2017. 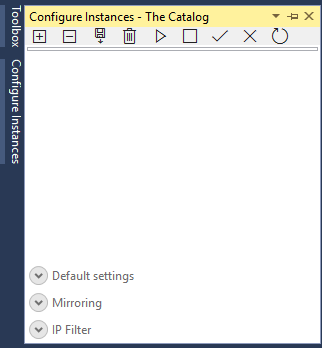 The same configuration opportunities can be found under "Configure Instances" window as in The Catalog R2. Here we can edit all the technical parameters of a selected instance (only if it is stopped). The same as the "Default settings" tab of The Catalog R2. Here we can add, edit or remove mirroring paths. The same as the "Mirroring" tab of The Catalog R2. Here we can add, edit or remove IP adresses which are enbaled to access the DB. The same as the "IP Filter" tab of The Catalog R2. Removes a selected DB instance. Installs a selected DB instance if all the deafult parameters are filled correctly and saved. Visual Studio must run elevated. Uninstalls a selected DB instance. Visual Studio must run elevated. Starts a selected DB instance service. Visual Studio must run elevated. Stops a selected DB instance service. Visual Studio must run elevated. Reloads the most recent configuration. Reloads all configurations and running instances's service states. The toolkit integrates the opportunity to manage The Catalog Instances created within Visual Studio 2017 as well as remote instances. Functionalities are similar to the "View" tab in The Catalog Manager (CatManager). The only difference is that the context menu (inside CatManager) has been partly recategorized and moved to a menu bar. 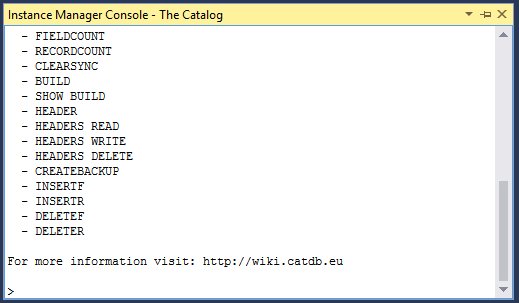 The CLI part of The Catalog Manager (CatManager). Works exactly the same. Similar to "EMO". Monitors events, creates a runtime log mostly for informational purposes. Especially useful during developement.